Frazer Couzens, director, SMART Room Systems at SMART Technologies Inc. said it’s worthwhile for integrators to observe what a day in the life of a meeting room at a potential client’s site is actually like. If you’re selling a system, the term “use case” should come up at least once during the conversation. The challenge is that “use case” means different things to different people, even if they’re all working in the same organization. What’s more, those who will be using the technology—the actual end users—often don’t have check-signing authority, limiting the impact of their input on how it should function, if they’re available for consultation at all. For the audiovisual professionals charged with the design and integration of these systems, this transforms a relatively straightforward question (“what do you need this stuff to do?”) into a multifaceted negotiation process, one that plays a leading role in affecting how satisfied clients are after all is said and deployed. In an ideal world, the discussion that defines use case should involve everybody who will touch the system in some way or form, from the C-suite executives that hold the purse strings, to those in the departments that will make use of the system, the individual or team charged with administering the system, and, if it’s a really ideal world, those who will be dialing into the system from the outside world. Chuckling yet? Yeah, we thought so. The problem is, both AV integrators and consultants can find themselves in a position where it’s tough to gain access to all stakeholders for a number of reasons: they don’t make themselves available; corporate politics dictate that they’re not permitted to make themselves available, forcing AV professionals to work through a gatekeeper; or, in the case of brand-new facilities, they may not exist because the organization hasn’t hired them yet. So what’s an AV pro to do? That’s not to say that the actual end users never show up for consultation; Tritz relayed that oftentimes, as a result of that document, they’ll come out of the woodwork and start voicing their requirements concerning system functionality. Unfortunately, however, they usually emerge late in the game, when the gatekeeper—who may be slightly less concerned with details pertaining to functionality—has signed off on the design. Now, not only has the conversation reverted back to use case, it also has the potential to drift into the uncomfortable world of scope creep. Does the organization have enough funds in the budget to account for these changes? And if it doesn’t, what then? John Greene, vice president of sales and marketing at Advanced AV, an AV design, integration, and managed services firm based in West Chester, PA, is currently evangelizing the need for integrators to employ user experience personnel that, in essence, “live” with a client, on-site, for a given period of time to determine what their pain points are, what they aren’t getting out of their systems, and what they really need. “We [should] say to customers, ‘we need to see what you’re really experiencing. We need to see what the system [looks like] today, and what you want it to look like tomorrow,’” he said. “And they’re [willing to invest the time in this] because they’ve over-spent on technology, which is one of the reasons for them to do it and for committing to it. And the other thing is, that AV person is not there [on site] anymore, and there are people from different disciplines that are making decisions—it could be the marketing person that’s the driving factor, it could be the IT person that’s the driving factor, or it could be the C-suite.” As of press time, Greene was in the process of closing a deal whereby an Advanced AV representative would be spending a couple of weeks at a client’s site for this very purpose. But if a client isn’t willing to sign up for two weeks, it’s still worth the AV integrator’s while to see if they can observe what a day in the life of a meeting room at a potential client’s site is actually like. 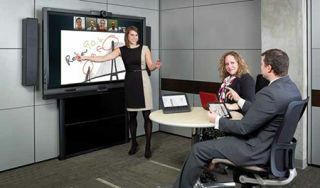 “Doing two-minute interviews with the users after meetings have ended could be extremely valuable,” said Frazer Couzens, director, SMART Room Systems at SMART Technologies Inc., a collaboration solutions developer headquartered in Calgary, Alberta, Canada. “Most organizations, as long as it’s unobtrusive, will be very amenable to that.” While he acknowledged that this requires companies to make a significant investment in their sales process, “the organizations that invest in that approach will reap the reward. The insight you gain from that is extremely valuable.” And, it gives the AV firm the opportunity to position themselves as the coveted “trusted partner” interested in helping their customers solve business problems, rather than a commoditized contractor that simply sells black boxes. While use case is often born out of a pretty straightforward requirement (“we’re running out of rooms and need more collaboration space”), it’s more challenging to define when an organization is diving into unknown territory (“we want to do business in a way we’ve never done before”). In this latter scenario, Tritz and his colleagues draw from their experience by examining past projects: “As a consultant, we see applications globally of other clients that have used technologies and facilities for very defined, very specific purposes,” he said. “In the case of the corporate individual that’s never had something, and is trying to define what it is they need and how often they need it, it’s a matter of trying to benchmark off of what others have done in similar industries; help them benchmark how often their current facilities are being used and what they’re being used for; and the end result of that use.” From there, it becomes easier to determine the return on investment—such as increased productivity, or faster to-market times, for example—that stands to result when the new technology is implemented.